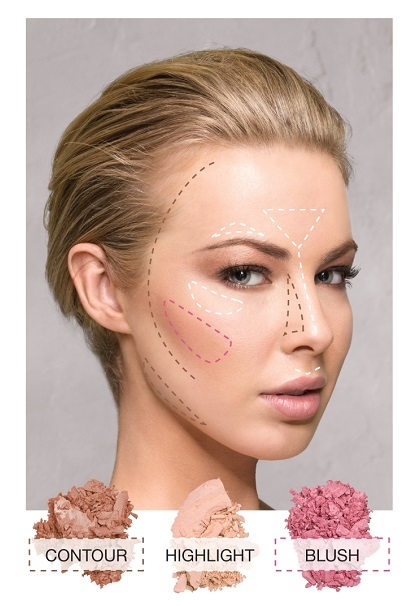 Highlighting and contouring has been a hot beauty topic, but leaves some of us wondering, how can I get this look? You don't need Photoshop to get that straight-from-the-red-carpet celebrity look! Perfectly chiseled cheeks and multidimensional warmth are just a few steps away with Pur Minerals. The first rule of contouring is to work from light to dark. That means starting out with your lightest shade and adding progressively darker shades. Using a shade that's slightly lighter than your natural skin tone, apply a concealer, like Pur Minerals Disappearing Act, above your cheekbone and over areas where the sun naturally hits, such as your forehead and the bridge of your nose. We love the buildable and blendable coverage of this 4-in-1 concealer! After highlighting, apply your foundation as you normally would. An all-in-one correcting formula, like Pur's 4-in-1 Pressed Mineral Makeup, (my personal fave! ), won't just conceal imperfections like dark spots and blemishes; it will actually help improve your skin's appearance with built-in skincare ingredients like Waltheria Extract, ceramides and vitamin A. How awesome is that? Using a powder brush, apply bronzing powder beneath your cheekbones, below your jaw line and along the outer edges of your forehead. Rich in good-for-you antioxidants, Mineral Glow by Pur Minerals adds the perfect touch of natural depth, mimicking the skin's own golden undertones for a look that’s never orange or streaky. Now that you've sculpted your features, it's time to add some color. Using a blush brush, sweep blush over the apples of your cheeks, blending up to the hairline for a multidimensional look straight from the makeup artist's chair! If you haven't yet, you HAVE to check out Pur's new Chateau Cheeks blushes, available in powder and cream formulas. How do you highlight and contour? Show us on Pinterest and Instagram with #beautystoredepot! We'd love to see your looks! Until next time...stay tuned and stay beautiful! Nice post. I learn something more challenging on different blogs everyday. It will always be stimulating to read content from other writers and practice a little something from their store. I’d prefer to use some with the content on my blog whether you don’t mind. I’ll give you a link on your web blog. I recently came to know about https://avanaaustralia.com.au/, their Mineral Makeup products are very effective. Mineral Makeup Thanks for sharing. nice tutorial .... do you have any video link for this? Hot Product: Avene XeraCalm A.D for itchy skin!